Registration for the 2017-2018 School Year is open! You must be registered by TODAY to avoid the late charge of $100. To view tuition charges and the educational contract, login to RenWeb. Information can be found by looking under School Information, Resource Documents, and Newsletter Archives. Please send the the $200 registration fee along with your signed agreement to be sure you are registered. Registration forms are also available in the office. REMEMBER: In order to try out for cheerleader, you must be registered by TODAY!! A sample is available to view outside the office! Don't forget to purchase your yearbook! They are $75 and can be paid for in the office. The deadline to buy a book is Friday, March 10. See Molly Cooke or Lucy Heaton for details. Monday at 12:05 in the library, the Admission Counselor from Ole Miss will meet with all Juniors. Reminder: Please note that we are enforcing the dress code at Lee. Please refer to your handbook for the rules. Only Lee Academy collared shirts may be worn under jackets. 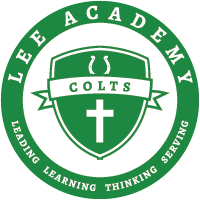 Fridays you may wear Lee Academy T Shirt or Spirit wear under jackets. Jackets must be grey, black, beige, tan. No large logos on jackets. The Colt Character Trait for the month of March is Forgiveness. The service project for the month of March is Griffin's Run - The annual 5K "Dash for Down Syndrome" sponsored by the Graves Family in honor of their son, Griffin Graves. All proceeds will benefit Reece's Rainbow - This organization serves to advocate and find families for orphans with Down Syndrome and other special needs by raising funds for adoption grants and promoting awareness. Students are asked to bring bottled water for the event scheduled for March 25th. Lee will sponsor blue jean Friday for $1 again on March 10. Students may wear jeans with a Lee Academy T-shirt or uniform shirt only! Students are also asked to support and participate in the event by running or walking on March 25th. Registration forms are available at Lee. You may turn in your forms to Raychel Lunceford. Mark Noland will be here to lead Chapel during Student Support Periods on March 7th. The Chase Bailey 5K Color Run will be held on April 8. Registration and Order forms are on the table outside the office.